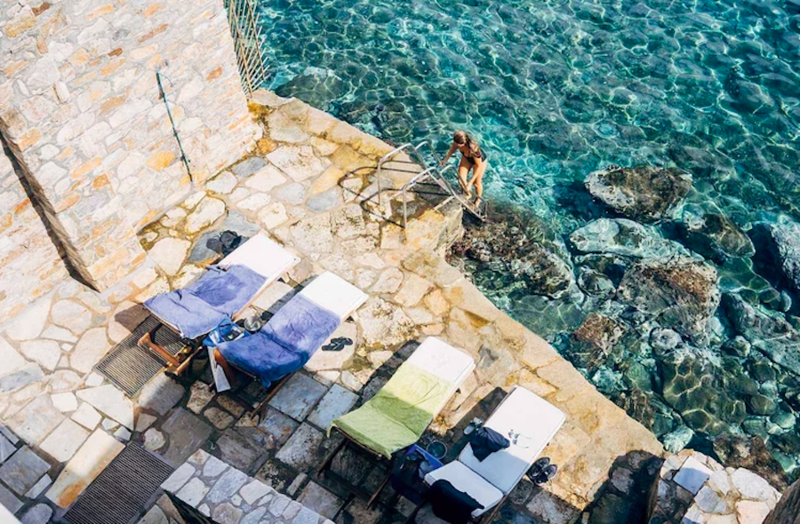 Syros may lack the white-sand wonders of its more popular neighbors. But for a certain kind of in-the-know traveler, that’s precisely its appeal. As my husband, Emilio, and I lay on the deck of our Airbnb, I realized I’d run out of time to shower before the symphony. Eyeing the ladder that descended into the Aegean, I told Emilio that I would just jump into the ocean instead. “Any time you can say that, it’s a good day,” he replied. Every summer, after visiting my relatives in northern Greece, my husband and our two young children — Amalia, 6, and Nico, 3 — set out to discover someplace in the country new to us. We’d been on the Cycladic island of Syros for only half an hour, but we could already tell we’d made a good choice. On other islands, such as Syros’s neighbor, Mykonos, we’d debated whether to stay in town or on the beach. Here, we were in the heart of Ermoúpolis, the Cyclades’ capital — an Italianate dream of palazzos, theaters, and cafés that is home to half the population of Syros — but the sea was steps from our front door. While Syros is on the same ferry line as Mykonos, it sees a fraction of that island’s foreign pilgrims, perhaps because it was long viewed as a commercial and industrial hub with massive shipbuilding operations. With fewer spectacular beaches than some of the Cyclades, Syros doesn’t fit the lazy-whitewashed-village-atop-a-sandy-shore vision most Americans have of the islands. The visitors who do come — the majority are from France and Scandinavia — are drawn by the festivals and thriving art scene, the more than 1,300 Neoclassical buildings, and the incredible cuisine. If Ermoúpolis keeps Syros from being thought of as a desert-isle dream, the fact that the island has a thriving city by the sea makes it alluring to those interested in life beyond the beach. Bobbing in the waves opposite our room, I gazed up at the row of palazzos. Nearby, teenagers cannonballed off the large dock that is the town swimming spot. Atop the hill that rose behind them was the blue and gold dome of the church of Agios Nikolaos, patron saint of sailors. The view of Ermoúpolis from the sea, I realized, is even more stunning than the view of the sea from the land. 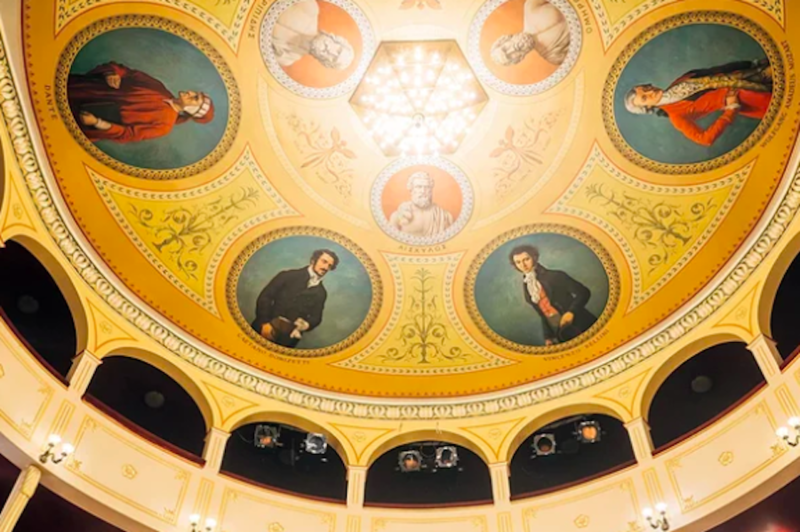 That evening, I found myself staring up again — this time at the ceiling of the Apollon Theater, which opened in 1864 and was modeled after La Scala and other Italian theaters. We were attending the opening night of the Festival of the Aegean, a two-week celebration of opera, music, and dance held every July. Before picking up his baton, the Greek-American conductor Peter Tiboris, the festival’s founder, urged the audience to notice the frescoes. The outer ring shows Verdi, Bellini, Dante, and Mozart; the inner ring Homer, Aeschylus, and Euripides.